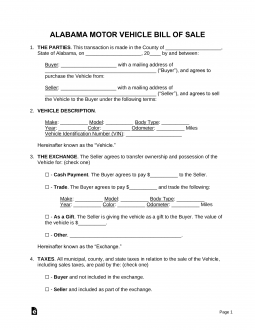 Abandoned Vehicle Bill of Sale – According to Section 32-13-4 if it has been abandoned and towed the owners must be given at least thirty (30) days’ notice before being sold. Firearm Bill of Sale – For any type of gun including pistols, rifles, etc. General Bill of Sale – For any personal property such as a bicycle, equipment, trailer, animal, etc. Motor Vehicle Bill of Sale – To transfer the ownership of a vehicle. The new owner must register within twenty (20) days or extra penalties/fees shall be charged. Vessel/Boat Bill of Sale – The purchase and sale of a boat. The new owner must tag and register within fifteen (15) days from the sale date. Form MVT-5-10 must be completed by a licensed official.